Since VK-2 is set up as a modular synthesizer, it takes a little bit of work to get a basic synth configuration from device. Fortunately, these settings are available from the “Reset Device” right-click menu. It’s useful to know exactly what “Reset Device” does in case you end up with settings that aren’t making sound. Here is what the default patch looks like. Typical synthesizers have their oscillator frequency controlled by the keyboard by default. Sometimes there is a keyboard tracking control that adjusts the tracking amount. In VK-2, the keyboard has to be manually connected to the oscillators. You can see in the default patch that this has been done for all three oscillators. The frequency modulation amount adjusts the keyboard tracking, turn it all the way up for standard tracking. You will typically see volume controls for each oscillator in a standard synth. In VK-2, any signal can be routed into the Mixer. In the default patch, sawtooth waveforms from each of the three oscillators have been routed there, plus a noise source. This setup is similar to VK-1. Simply choose other oscillator waveforms in the mixer as desired. VK-2’s filters are similar to other synthesizers’, but you must choose the input signal. The standard signal path for an analog synth is oscillators to mixer to filters to amp. So, in the filters section, the typical input would be the mixer output. You can see that Mixer is chosen for Signal in the default patch. The envelopes in VK-2 are general purpose, typically you would have an envelope dedicated to a filter. The default patch has Envelope 1 configured to control frequency, so Envelope 1 is now the dedicated filter envelope. Like in the filters section, the amp needs an input signal. Recall that the typical signal path is oscillators to mixer to filters to amp. So, in the amp, Filters is chosen for the Signal source. Also like the filters, an envelope is needed to control the volume. Envelope 2 is selected as a control input, making it a dedicated amp envelope. The only other configuration made in the default patch is a basic vibrato setup with amount controlled by the mod wheel. In order for the effect to be scaled by the mod wheel, a mod bus is used. In this case, Mod Bus 1 has LFO 1 as the source and mod wheel as the scale. In the Performance section, the pitch modulation target has Mod Bus 1 as its source. This creates the pitch modulation, commonly known as vibrato. These settings are very common, many of the factory sound bank patches have them. 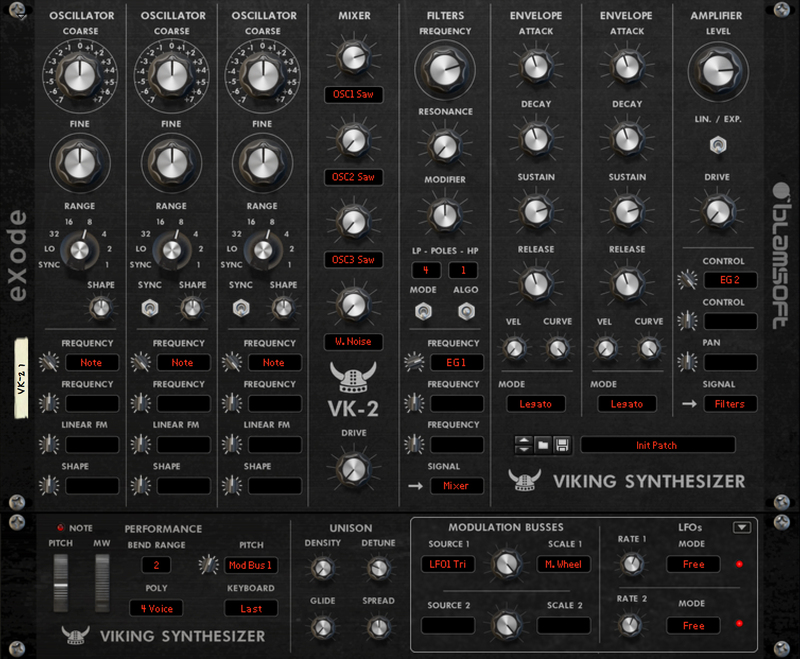 Now that you know what “Reset Device” does, if you find yourself in a situation where VK-2 isn’t working like a typical synth, you can check these settings without having to reset the device.